Description: Kershaw’s infantry division and Fitzhugh Lee’s cavalry, under overall command of Lt. Gen.
Richard Anderson (Army of Northern Virginia, I Corps) were sent from Petersburg to reinforce Early’s army in the Valley. At Front Royal on the August 16, Union cavalry of Brig. 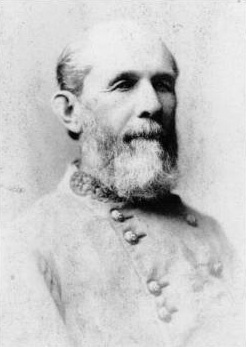 Gen. Wesley Merritt’s division surprised the Confederate columns in mid-stream of the Shenandoah River, capturing about 300. The Confederates rallied and advanced, gradually driving the two Union brigades back to Cedarville. After dark, Merritt withdrew to Ninevah. The Battle of Guard Hill took place on August 16, 1864, in Warren County, Virginia as part of Philip H. Sheridan's Shenandoah Valley Campaign of the American Civil War. 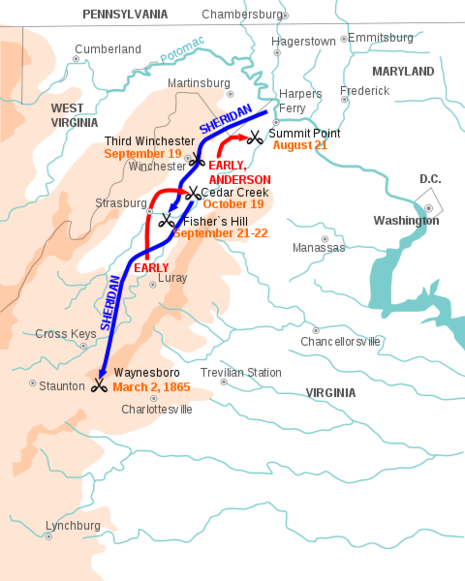 On the morning of August 16, Confederate General Robert E. Lee's troopers scattered the Federal pickets at the Shenandoah River crossing at Front Royal. The troopers pursued them down the Front Royal Pike, eventually coming to Guard Hill, a prominent landmark. There, they were hit by Union Brig. 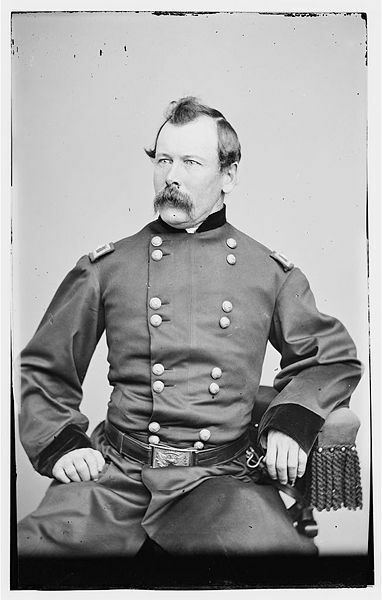 Gen. Thomas C. Devin's dismounted cavalry brigade and sustained heavy losses. Confederate Brig. Gen. William T. Wofford's brigade attempted a flanking movement by wading across Crooked Run. There, they were attacked by two New York brigades, who took 300 of them captive. Union Brig. Gen. George A. Custer's Michigan Brigade rode toward the battle and sustained Devin's line along Crooked Run until they were forced to withdraw to Cedarville by Confederate artillery now on Guard Hill.